Ok – so I skipped ahead a bit. I have a bunch of pictures and information from the assembly of the 2012 Boss 302 engine but it’s going to take a while to get everything organized and write that article. 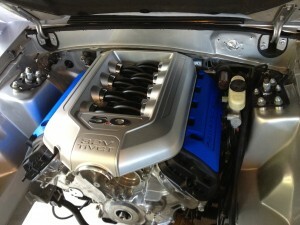 Here’s a pic of the installed engine. I painted the engine cover and intake to better match the car – and to make it a little different. Why no boss intake? Wouldn’t fit under the stock Hood. That’s exactly the issue. I prefer the lines of the stock hood. The Boss intake isn’t even close to fitting. Yeah figures. Surprise no aftermarkey ones out yet. Looking pretty sweet Jeff!!!! Can’t wait to read all the details!!!!! How did easy was it to piece the engine together? any snags in your original plans? did the Boss parts work well with the block? Awesome car. What about the dry sump? Where did that go? It looks more like the Aluminator to me. Jared – no dry sump. Funny when people comment and say what THEY think it is, when the person who wrote the post took the time to already tell you. Why would I take the time to post something that’s not true. C’mon man. Me – the biggest challenge was acquiring all of the little parts. I’m working on a parts list too.